Have fun with these old fashioned pull taffy recipes. You will love this delicious homemade candy confection that's simply so much fun to make! Treat your kids to an old time taffy pull and create some childhood memories they will never forget. This old fashioned pull taffy recipe is perfect for gathering the family together for an old fashioned taffy pull. It's originally from an old magazine clipping of unknown origin, dated 1915. Two cups granulated sugar, one-half cup water, two tablespoonfuls vinegar, one tablespoonful butter, one teaspoonful vanilla, one-half teaspoonful cream of tartar. Cook all ingredients except cream of tartar until a few drops will crack in cold water. Then add cream of tartar and pour on greased slab. Start to pull when cool enough to handle. Keep hands cool by washing frequently in cold water. Combine brown sugar, corn syrup, water, molasses, salt, and butter. Place over low heat and stir constantly until all sugar is dissolved. Continue cooking, stirring frequently to prevent scorching, until a small amount of syrup becomes brittle in cold water (290°F). Pour mixture onto greased platter. Pour melted chocolate and vanilla over candy. As candy cools on edges, turn edges towards center with spatula. Continue turning until candy is cool enough to pull with your hands. Pull until cold. Stretch out in long rope and break or cut into pieces of desired size. Store pieces in jar. Makes about 5 dozen pieces 1 inch long and 3/4 inches in diameter. 1st, 3 cups corn syrup. 2nd, 2 cups corn syrup and 1 cup molasses. 3rd, 2 cups corn syrup and 1 cup honey. Place either combination in a saucepan with 3/4 teaspoon salt. Butter the inside upper edge of the saucepan to prevent boiling over. Cook until the mixture forms a hard ball, when dropped in cold water. Pour candy mixture into a buttered shallow pan. Let it stand to cool until it can be handled safely. When cool enough, butter the hands and pull. After pulling, cut and wrap pieces in waxed paper. For Vanilla Candies, use white corn syrup, and add 1-1/2 teaspoons vanilla before pouring candy in the pan. For Peppermint, add a few drops of oil of peppermint while pulling. For Chocolate, add 3 squares of chocolate to syrup. For Nut Candy, add 3/4 cup chopped nuts to either vanilla or chocolate flavors, as it is cooling in pan, fold in toward center as it cools, and pull. One pound of white sugar, three tablespoonfuls of vinegar, one teaspoonful of lemon extract, one teaspoonful of cream of tartar. Add a little water to moisten the sugar, and boil until brittle. Put in the extract, then turn quickly out on buttered plates. When cool, pull until white, and cut in pieces. Two cups sugar, one cup water, one-fourth cup vinegar, one-half teaspoon of cream of tartar. (Boil until hard when tested in cold water.) No stirring allowed. Pour on a buttered pan and pull when cold enough. Take three cupfuls of granulated sugar, one and one-half cupfuls cold water, one-fourth cupful vinegar, butter the size of a walnut, boil until it will harden in cold water, then flavor with vanilla, pour into pans that have been buttered well, then pull until firm and white. Take equal quantities brown sugar and Orleans molasses (or all molasses may be used), and one tablespoon sharp vinegar, and when it begins to boil, skim well and strain, return to the kettle and continue boiling until it becomes brittle if dipped in cold water, then pour on a greased platter. As soon as cool enough, begin to throw up the edges and work, by pulling on hook or by hand, until bright and glistening like gold; flour the hands occasionally, draw into stick size, rolling them to keep round, until all is pulled out and cold. 2 cups Puerto Rico molasses, 3 tablespoons butter, 2/3 cup sugar, 1 tablespoon vinegar. An iron kettle with a rounding bottom (Scotch kettle) or copper kettle is best for candy making. If one has no copper kettle, a granite kettle is best for sugar candies. Put butter in kettle, place over fire, and when melted, add molasses and sugar. Stir until sugar is dissolved. During the first of the boiling stirring is unnecessary; but when nearly cooked, it should be constantly stirred. Boil until, when tried in cold water, mixture will become brittle. Add vinegar just before taking from fire. Pour into a well-buttered pan. When cool enough to handle, pull until porous and light colored, allowing candy to come in contact with tips of fingers and thumbs, not to be squeezed in the hand. Cut in small pieces, using large shears, or a sharp knife, and then arrange on slightly buttered plates to cool. 1 cup molasses, 3 cups sugar, 1 cup boiling water, 3 tablespoons vinegar, 1/2 teaspoon cream of tartar, 1/2 cup melted butter, 1/4 teaspoon soda. Put first four ingredients in kettle placed over front of range. As soon as boiling-point is reached, add cream of tartar. Boil until, when tried in cold water, mixture will become brittle. Stir constantly during last part of cooking. When nearly done, add butter and soda. Pour into a buttered pan and pull same as Molasses Candy. While pulling, add one teaspoon vanilla, one-half teaspoon lemon extract, few drops oil of peppermint, or few drops oil of wintergreen. 2 cups sugar, 1/2 cup vinegar, 2 tablespoons butter. Put butter into kettle; when melted, add sugar and vinegar. Stir until sugar is dissolved, afterwards occasionally. Boil until, when tried in cold water, mixture will become brittle. Turn on a buttered platter to cool. Pull, and cut same as Molasses Candy. 3 cups sugar, 1/2 cup boiling water, 1/4 teaspoon cream of tartar, 1/2 tablespoon vinegar. Boil ingredients, together without stirring, until, when tried in cold water, mixture will become brittle. Turn on a well- buttered platter to cool. As edges cool, fold towards center. As soon as it can be handled, pull until white and glossy. While pulling, flavour as desired, using vanilla, orange extract, coffee extract, oil of sassafras, or melted chocolate. Cut in sticks or small pieces. One cup brown sugar, one and one-quarter cups corn syrup, four heaping tablespoons of butter. Put these ingredients on to boil, and just before it forms a hard ball in cold water, add vanilla, and a pinch of soda. Pour onto buttered platters and pull when almost cold. Be careful not to get the mixture too hard. From the end of World War One and throughout the Great Depression of the 1930s, "taffy pulling" was a popular, affordable form of Saturday night entertainment in many Canadian and American homes. And who can ever forget the distinctive "swoosh" and "slap" sounds made when an experienced taffy puller at the county fair stretched and looped a five-foot length of sticky taffy over a large iron hook fastened to the corner of his concession stand? After watching it being pulled and cut, you couldn't resist buying a piece. I know I couldn't. That old fashioned pull toffee tasted so good. It was sometimes left in its natural whitish-tan color and wrapped in waxed paper, but some puller's added red or yellow food coloring to give it more appeal to the youngsters. Now, you can make your own right in your kitchen. By the way, these old fashioned taffy recipes aren't just for Welshmen — (a little pun in memory of my Welsh friend, Alun). They're for anyone wanting a chewy candy that's very easy and affordable to make. Taffy pulling can be a fun activity for your entire family. 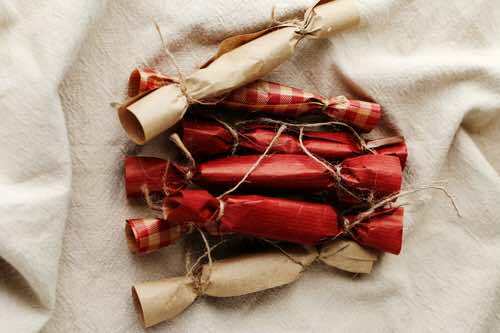 Bookmark this page and plan to make some old fashioned candy this weekend. 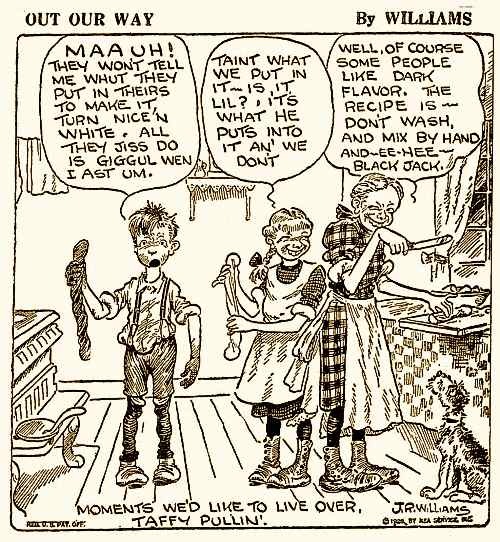 Just don't follow the bewildered young boy's example in the Out Our Way cartoon below. Mom told me of the times in her family when they made homemade taffy in the 1920s. She and her brothers and sisters would divide into pairs, and each pair would take a big piece of taffy and pull it until it was almost pure white in color. They would quickly hand-roll it into thin strips. Then, with scissors they cut it into bite-sized pieces that they wrapped in tiny squares of waxed paper and sealed by twisting the ends. Ever since I heard those wonderful family stories as a boy, I wondered what that old fashioned candy would have tasted like. Now, thanks to these original pull taffy recipes, I can enjoy it anytime. And so can you! 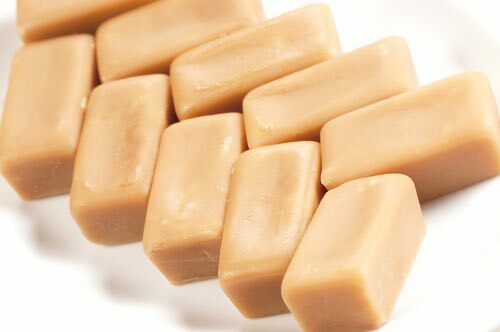 Make some toffee candy today and experience its nostalgic taste.